Swimming was the top sport kids in Baltimore told us they wanted to try, with 23% of youth selecting it in our survey. Yet nationally, nearly 70 percent of African-American children don’t know how to swim, and only 1 percent of registered USA Swimming members are African-American. Given the research and with assistance from Project Play: Baltimore, the USA Swimming Foundation and Baltimore City Recreation and Parks (BCRP) teamed up to host a Make a Splash Tour stop at Druid Hill Park Pool on June 2. Cullen Jones (middle) assisting Baltimore Recreation and Parks staff with swim instructions. As part of the Make a Splash clinic, four-time Olympic medalist Cullen Jones came to Baltimore to help teach youth how to swim and share his experience with swimming. “I want to change ‘black people don’t swim.’ Yes, we do. We just need to learn and have these lessons,” Jones told the Baltimore Sun. Hometown hero and Olympic gold-medalist Michael Phelps plays a part in the interest level of the sport, but black swimmers like Jones and Simone Manuel are also inspiring kids, especially kids of color. Twenty-one percent of black youth said that they want to try swimming, which is second to basketball. Among Hispanic or Latino youth, 28 percent want to try swimming – their top selection. Learning how to swim is an important skill to develop. Swim lessons can help reduce drownings, the second-leading cause of unintentional injury death in children ages 1-14 years old. There is a greater risk of drowning for African-American youth than white children. Learning to swim can also open opportunities to an array of water-based sports – from triathlon to rowing. As a sport, swimming improves cardiovascular health and can be part of a healthy lifestyle across the lifespan. It can also open job opportunities, such as Dunbar High School swimmer Keney Davis turning her newfound interest in the sport into a job as a summer pool attendant. Those opportunities are now more available to the 30+ kids who participated in the learn-to-swim program. 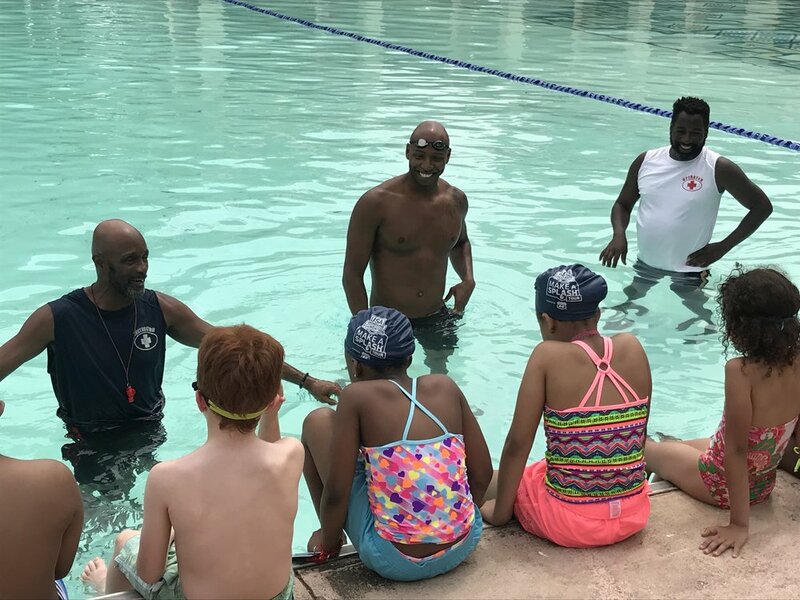 Youth learned the fundamentals of swimming and essential water safety tips from Jones, Olympic gold-medalist Joshua Davis, and BCRP instructors. Kids also got the opportunity to ask Jones questions, get his autograph, and take a photo with him. All participants have the option of receiving additional, discounted swim lessons through a BCRP program that encourages more kids to swim. To support the effort, the USA Swimming Foundation awarded BCRP’s aquatics division with a $2,500 grant. Baltimore City Recreation and Parks is also now a Make a Splash Local Partner, which makes BCRP eligible for grants up to $15,000 to support swimming needs and instructional swimming materials. The collaboration between USA Swimming Foundation and Baltimore City Recreation and Parks is an example of what good can happen for youth when sports and recreational organizations come together. This is only the beginning. The future looks bright for more youth in Baltimore to have the chance to swim by learning the basics first.